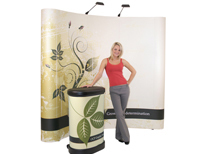 Coyote 8 foot pop up displays are ideal for 10x10 or smaller trade show booths. Lambda graphics are included in every kit which are the highest quality graphics available. Not only are they extremely clear and colorful, but they are extremely durable and have a lifetime warranty. Northwest Creative Imaging offers such great pricing on these displays that we can include Lambda graphics and still beat our competitors pricing! Our kits include lights and shipping case with optional case wraps so you can use the shipping case as a podium! 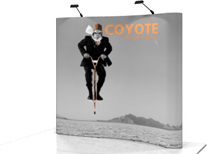 8 foot Coyote pop up displays are a great trade show display solution for anyone looking to make an impact at a trade show. The Lambda mural graphics are the highest quality in the industry. The clarity is similar that of a high definition television. The prints are also extremely durable and have a lifetime warranty. 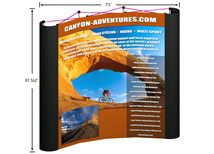 We also offer a large selection of banner stands, trade show accessories, and hanging banners to accent your trade show booth!